About the picture above: This is myself and Brinks. Brinks was given to me 2.5 years ago by my friend, Brinks is a 8 yr young boy, he is the best gift anyone could ever give me. Being a retired working dog I tried a few different things to see what “he” enjoyed the most. I have never tracked before and heard of Gary through my friend Ginny who tracked with Gary prior. I called him and he was so informative and made me feel at ease about venturing in to something new. So we began tracking in the spring, Gary was wonderful with my dogs, patient and very knowledgable , always coming up with different and creative ways to best suit my dogs tracking style. I learned a lot in such a short time and believe this is due to Gary always making classes enjoyable and keeping things simple so I understood . By September Gary asked if I would like to trial my older boy Brinks at first I laughed but Gary assured me we were ready!! I trialed in September and missed passing by about a foot, but Gary took all the positives in our track and we worked on them the next day in class. So in November I decided that we were ready to try again, and this time I was confident that Brinks was ready, Gary was positive I was ready ! We showed up and Brinks being his awesome self tracked like a pro, and we passed getting his TD!!! I don’t know if I could of done it without the patients and knowledge of Gary!! I highly recommend Gary , and thank him for all he does to keep this wonderful sport fun!! 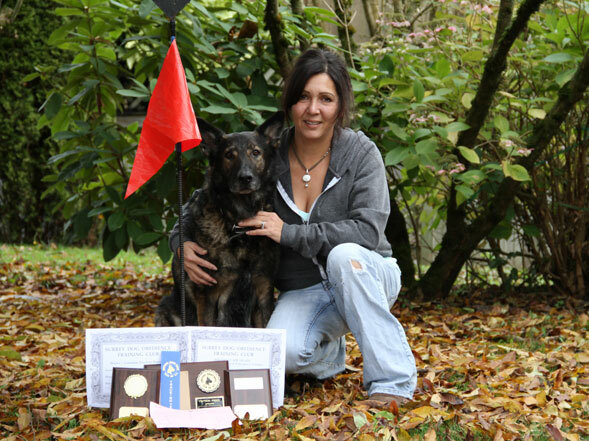 This site is designed and presented for all aspects of Tracking Dog Activities. It can be as simple as tracking for the pleasure and exercise or entering tests. This discipline is for both dogs and handlers working in unison, which tends to build a strong bond with each other. This activity can also lead towards getting a degree in Tracking Tests in Canada and the U.S.A. 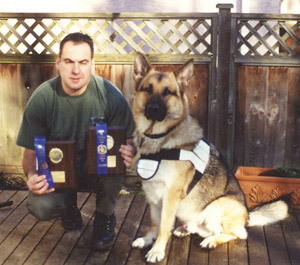 The above picture is York Furstenwald with Brudie, German Shepherd receiving T.D. in the spring and T.D.X. in the fall of the same year. Trained at Surrey Dog Obedience Training Club. Brag Page to let others know of your accomplishments in this tracking disipline. Tracking News Page to let others know of activities that have occurred like Seminars etc. Tracking Articles Page to inform and develop a better understanding of each aspect of tracking styles or types of tracking methods. Tracking Forum Page to express your ideas and thoughts with others in tracking. Clubs Page to be aware of the Clubs located in your geographical area. Links Page to have the opportunity in one location to surf the web in contacting other Clubs or Organizations related to the activity of tracking. And more Information as it relates to the Tracking community. If you have any thoughts or ideas on this Website contact the Webmaster in the Contact Us Page. Errors and omissions accepted. 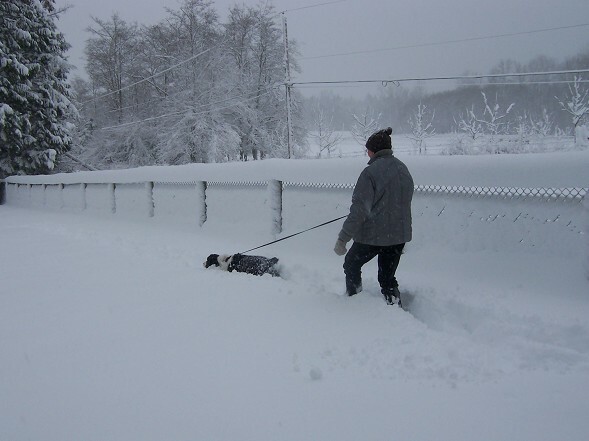 Terrie Simpson with her English Springer Spaniel Amie tracking in the snow.